MOSCOW, August 23. /TASS/. Cargo spacecraft Progress MS-08 has been undocked from the International Space Station (ISS) Thursday morning. 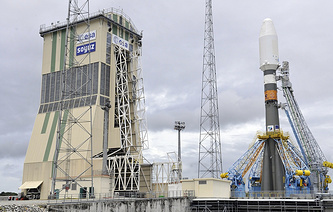 Its deorbiting is due on August 30, the rocket and spacecraft scientific center TsNIIMash said. "In accordance with the ISS flight program the cargo spacecraft Progress MS-08 was undocked from the Russian segment on August 23, 2018," the statement runs. At 05:16 Moscow time the spacecraft left the docking port of the Russian service module Zvezda. At 05:19 the spacecraft’s engine was turned on to take Progress MS-08 to a safe distance. "Under the flight schedule the cargo spacecraft is to be deorbited and dumped in the ocean on August 30, 2018. According to ballistic and navigation specialists at Mission Control the engine will be burned to slow down the spacecraft at 04:23:27 Moscow time," the report says. Three minutes later the spacecraft will leave its orbit and at 04:58 enter the atmosphere. Unburned parts and fragments will fall into the Pacific Ocean at 05:07 away from busy shipping routes, TsNIIMash said.